Doesn't code /sword for the Sword of Triton still work? If it does, I'm not sure why we really need an almost identical sword. This one is just a sword straight from the Military Broadsword weapon line. It pretty much is a prequel to the common Military Broadsword itself. Guess it doesn't really matter, though. 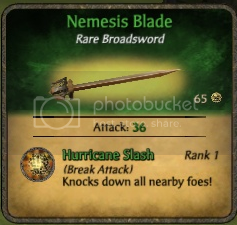 I just wish there'd be something the Nemesis Blade could have that could set it apart from other swords. Something unique. Probably they did it to give newly created pirates an alternative to Triton. It looks different and blends well unlike Triton which is very noticeable. Triton is meant for QAR and requires some considerable experience in Notoriety and Skills to survive. The odds of missing are too high for a young pirate. Therefore giving them an alternative makes more sense. No need to purchase when gold is scarce and no need to wait until a common military broadsword is found in a loot drop. Oh yeah, for a kid, especially, whom Disney has in mind mostly to appeal, it looks cool, awesome, rad, etc. So I reckon.